Have you ever looked at your old 70’s era brick fireplace and wondered if you can update it’s look? Well the answer is yes you can and cheaper than you thought. You do not have to tear it out and start again. You can resurface it by adding stone veneer over a brick fireplace. 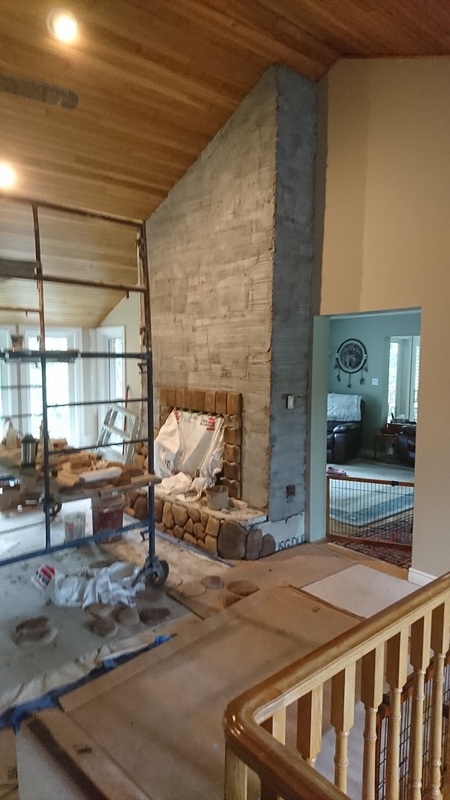 In this blog I will discuss a project where we put River Rock by Dutch Quality Stone right over an existing brick fireplace. The homeowners had lived in the house for a few years and had never really loved the brick look. And when they had the gas insert put in the insert was not a perfect fit. So they decided to resurface the existing look with stone veneer over a brick fireplace. River Rock appealed to them and with the Buckeye colour from Dutch Quality they made the decision to make the improvement to their home. 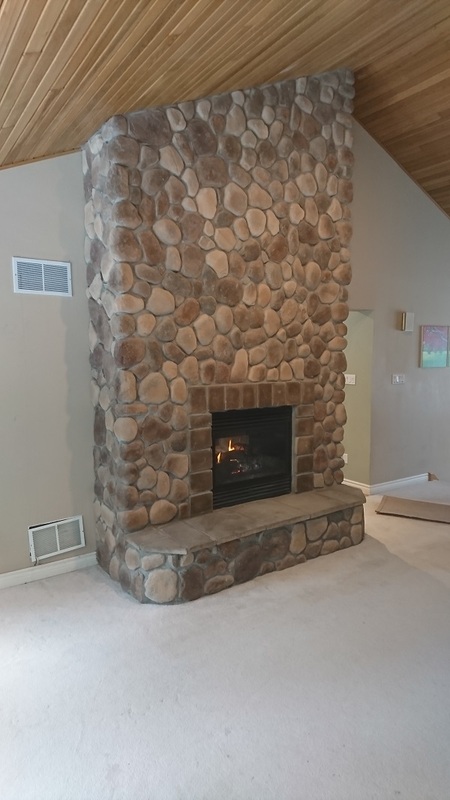 There are many options when deciding to resurface a brick fireplace with stone veneer. The fact that there are so many colours and styles of stone patterns to choose from it is easy to find a style and colour that suits any and all tastes. Whether you want a traditional stone fireplace or a ultra modern look there is a stone veneer product that will suit every style. 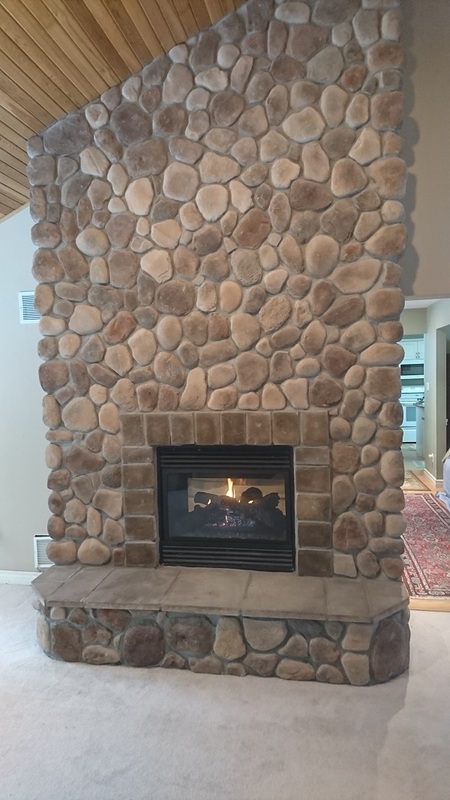 Call us today at 705-835-6759 to book a consultation and we can help you find the perfect stone to transform your existing brick fireplace or enhance your new build. Note: to see any photo below in a larger size simply right click on your mouse over the desired photo and select open image in new tab. Dutch Quality River Rock- Buckeye stone veneer over a brick fireplace. The addition of the Fog coloured hearth and trim stones really compliment the overall look. Scratch coat applied directly over brick fireplace. Stone being applied to scratch coat. 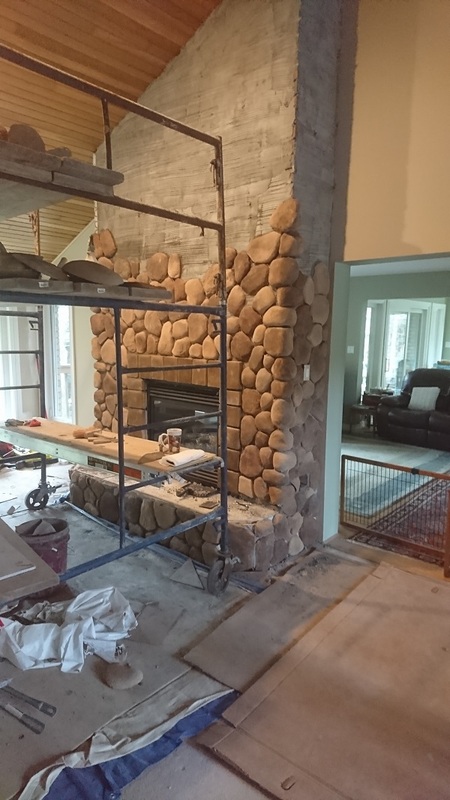 The completed fireplace with River Rock applied over the brick fireplace. Before image of painted brick fireplace. 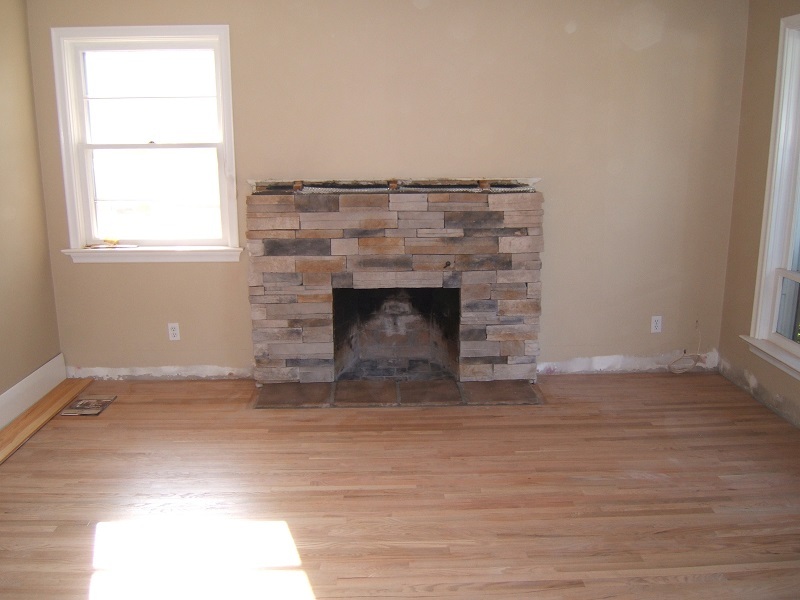 The images to the right and left show the same brick fireplace as a before and after shot. 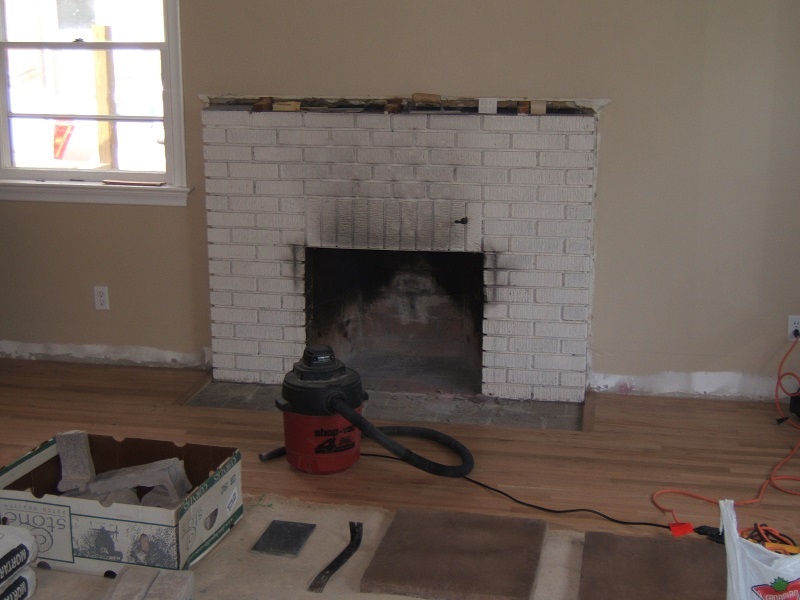 The image to the left is a painted fireplace that originally had a mantle on top but was removed so fireplace could be resurfaced with stone veneer. The image to the right is the same fireplace only with stone veneer over the brick. When dealing with a painted fireplace there is an extra step needed in order to resurface with stone veneer. As the paint on the brick makes it impossible for any mortar to adhere; a wire mesh substrate or cement board must be added first. Once the mesh is securely affixed the stone veneer can be added. It really does create a complete transformation and a spectacular look. 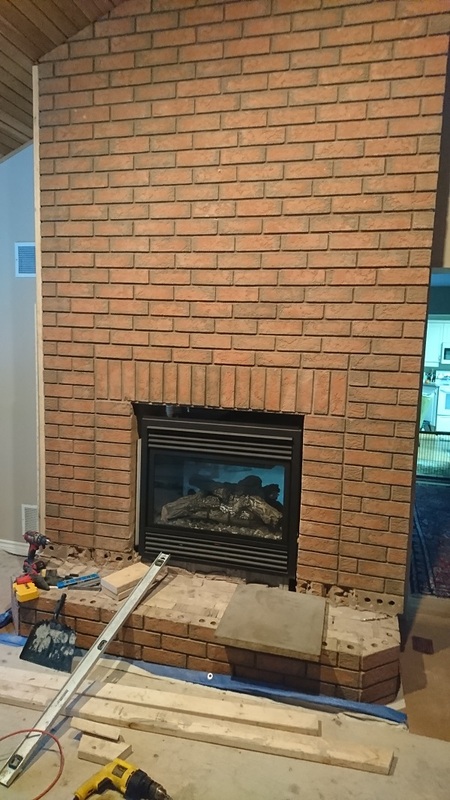 After photo of painted brick fireplace with stone veneer and matching hearth stones. Copyright © 2014 - 2019 The Cultured Stoners | Developed by Zeus Systems Inc. | Website Management by Zeus Systems Inc.